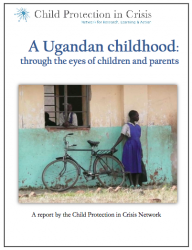 In 2011, 320 children and 150 parents from across Uganda participated in a consultation on the nature of childhood in the country. Children shared their hopes as they described what they saw ‘doing well’ as a child to mean and parents indicated their own aspirations for their children as they too described what they saw as marking those children who were ‘doing well’. The following outcomes emerged from the consultations and the ethnographic research: reduced troubling thoughts and feelings; improved self-esteem, sense of control and pride over physical wellbeing, relationships between children and their primary caregivers, social relationships with peers, and social competence; positive relations with non-family adults and attitude and achievement-oriented behavior towards learning; and increased proactive behavior and problem solving. The findings suggest some key characteristics defining children’s well-being and revealed important differences in the perspectives of children and parents, and in expectations of boys and girls, that inform work in promoting children’s well-being across the nation.